Ready to lift a bus, dump truck and some truly heavy farm equipment? 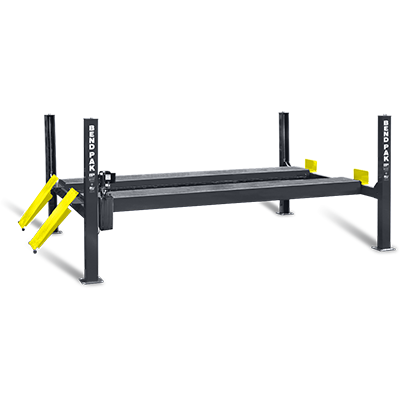 You may just need the HDS-18E, BendPak’s 8,165-kg. capacity four-post truck lift that also handles your low-rise sports cars and compacts with ease. To accommodate long wheelbases, the HDS-18E offers extended runways that are 6,680 mm front-to-back. This is the first of the heavy-duty models to offer extended runways. All 27K, 35K and 40K lifts are built this way. Better-gripping runways ensure the massive tires on your massive vehicles stay put. If the runways gets slick, their treaded surfaces are still able to grab the wheels without damaging or marring them. 305 mm x 305 mm base plates don’t just provide a solid foundation, they inspire the confidence to work on virtually any-size vehicle up to the rated weight capacity. Supersized 305 mm diameter cable sheaves within the runway and cross tubes, combined with massive 102 mm diameter sheave axles, dramatically improve cable wear and critical component lifespan, meaning this car lift increases your safety, so you spend less money in service-related expenses down the road. The HDS-18E four-post lift features four​ galvanized lifting cables that do an excellent job of providing abrasion resistance and preventing fatigue.